Pharmacy Purchasing & Products: What policies and procedures (P&Ps) should be in place for cleaning engineering controls? Areas Requiring Cleaning. Define each area and specify the surfaces (eg, walls, floors, surfaces within PECs and containment primary engineering controls [C-PECs]) and items (eg, furniture, equipment) in the areas that must be cleaned, the order of cleaning, and the cleaning frequency. Equipment Used for Cleaning. List the types of cleaning equipment to be used and delineate how and where they are to be used. In addition, specify procedures for cleaning and storing reusable equipment (eg, mop handles) and detail how disposable cleaning equipment (eg, mop pads, wipes) should be disposed. Cleaning and Decontaminating Agents. Specify which cleaning and decontaminating agents are to be used for which surfaces, and include application methods, frequency, and minimum contact (dwell) time. If agents must be prepared or diluted, detail the preparation process and instructions for labeling the prepared product. Garb and Personal Protective Equipment (PPE). Describe the garb and PPE that must be used while performing cleaning activities in various areas. For example, garbing and PPE for cleaning C-PECs and containment secondary engineering controls (C-SECs) in hazardous drug (HD) compounding areas are different than what is required in non-hazardous areas. P&Ps should also specify how garb is to be disposed, including special disposal procedures for garb used in HD areas and cleaning and storage procedures for reusable PPE (eg, goggles and respirators). Personal Hygiene. Describe the appropriate attire for cleaning personnel entering the compounding area and garbing procedures (ie, donning and doffing) as well as hand hygiene procedures. Responsibility for Cleaning Activities. Define who is to perform the various cleaning activities. Required Documentation. Delineate the documentation required for cleaning activities, including the frequency of documentation. 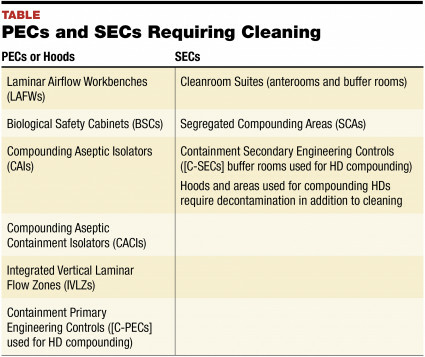 The requirements for cleaning engineering controls outside of a cleanroom (ie, in a segregated compounding area [SCA]) are the same as those within a cleanroom suite. Therefore, P&Ps for cleaning will be identical for both areas. Developing P&Ps for cleaning HD spills is detailed in the SIDEBAR below. PP&P: Who should be responsible for cleaning engineering controls? Murdaugh: Although properly trained, competent nonpharmacy staff, such as environmental services personnel, may perform cleaning activities, only compounding personnel are qualified to clean sensitive equipment, such as PECs, C-PECS, and automated compounding devices. Staff cleaning engineering controls must have knowledge of basic infection control principles in sterile compounding areas, including personal attire, hand hygiene, garbing, cleaning and disinfection, principles of airflow within all types of PECs and C-PECs used in the organization, appropriate movement of personnel and supplies within the areas, and safe handling of waste, including sharps. PP&P: What PPE should be used by the staff member conducting the cleaning? Murdaugh: Cleaning personnel must wear the same PPE as the compounding staff: hair cover, facial hair cover (if applicable), face mask, shoe covers, gown, and gloves. Eye and face protection (eg, goggles) must be worn if there is a risk for splashes or spills. When cleaning an HD compounding area, additional PPE must be worn, including a second pair of shoe covers, a chemotherapy gown, and two pairs of chemotherapy gloves that meet the ASTM D6978 testing standard. Eye and respiratory protection also are required, especially when cleaning C-PECs used for hazardous compounding (biological safety cabinets [BSCs] and compounding aseptic containment isolators [CACIs]). PP&P: How should pharmacy staff be trained in cleaning processes, and how often should they be observed for proper technique? Murdaugh: Both the new proposed USP <797>, as well as the current USP <797>, require that training include didactic and experiential components for all activities performed in sterile compounding areas, including cleaning. The didactic training portion is knowledge-based and must comprise the basic principles of hand hygiene, garbing, and cleaning. In addition, staff must review the applicable organizational P&Ps. Didactic training can be provided by various means, such as printed materials, Web-based training programs, and educational recordings. Written testing is required to evaluate staff competency. Hand hygiene, garbing, and cleaning competencies must be assessed initially and then at least annually thereafter. For those staff members performing cleaning, who also compound high-risk preparations, hand hygiene and garbing must be assessed semiannually. Note that the proposed revision to USP <797> could require different frequencies for these assessments than the current version of the chapter. In addition to the scheduled assessments, cleaning personnel should be observed on an ongoing basis to identify and remediate any incorrect practices. It is important to note that individual state boards of pharmacy or other state regulations may require more frequent assessments. PP&P: How can environmental monitoring be used to ensure cleaning is effective? Murdaugh: Surface sampling is utilized to substantiate the effectiveness of cleaning procedures. Any results exceeding action levels, as well as consistent elevations or increases of microbial growth over time, must be addressed. As part of an investigation into the source of contamination, cleaning staff should be reevaluated for correct hand hygiene, garbing, work practices, and cleaning techniques. If incorrect practices are identified, retraining and retesting of staff is mandatory. An additional monitoring tool that can be used to assess the adequacy of decontamination and cleaning in HD compounding areas is surface wipe sampling for HD residues. When levels of contamination exceed the action level established by the facility, reevaluation of personnel work practices, including decontamination and cleaning procedures, should be included as part of the investigation into the source of contamination. If incorrect practices are identified, retraining and retesting of staff are critical to ensuring safe practice moving forward. The Joint Commission. Consistent interpretation. The Joint Commission Perspectives. 2018;38(6):14-16. Lee Murdaugh, BS Pharm, PhD, is director of accreditation and medication safety for Cardinal Health Innovative Delivery Solutions. She is the author and editor of the American Society of Health-System Pharmacists (ASHP) publication Competence Assessment Tools for Health-System Pharmacies and co-author of Assuring Continuous Compliance with Joint Commission Standards: A Pharmacy Guide. Lee’s experience also includes providing USP <797> and <800> expertise and support to pharmacies. P&Ps for the management of HD spills should encompass spills that occur outside the HD compounding area as well as spills in C-PECs and C-SECs. ASHP’s updated Guidelines on Handling Hazardous Drugs is an excellent source of information for developing spill management procedures. The updated guidelines are available at: www.ashp.org/Pharmacy-Practice/Policy-Positions-and-Guidelines. Define the sizes and types of spills that may occur, identifying potential spill volumes and locations (eg, within an HD compounding area; in a location accessible to patients, visitors, and non-pharmacy staff). Specify who is responsible for management of each spill type. For example, large spills may require additional assistance from other personnel in the organization. Identify training requirements for staff participating in spill management, including fit-testing of respirators. Define the contents and locations of HD spill kits and other cleanup materials. Specify PPE required for spill management, including respiratory protection. Provide detailed, step-by-step procedures for spill management and cleanup, including notification of appropriate staff and restricting access to the spill area. Spill management may require different procedures depending on the size, type, and/or location of spills. Specify the agents used to decontaminate and clean the spill area and describe appropriate decontaminating and cleaning techniques. Specify the containment and disposal of spill cleanup materials, including used, disposable PPE. Describe procedures for medical evaluation and treatment of staff and non-staff exposed or potentially exposed during the spill or cleanup. Include any documentation, such as incident or exposure reports, as required by the organization and/or by federal, state, and local laws and regulations. Ensure complete documentation of spills and spill management, as required by policy as well as laws and regulations. Staff participating in spill management must be trained in accordance with their specific roles. Training and competency assessments must be conducted at least annually or more frequently if required by organizational policy or laws and regulations. It is recommended that “spill drills” be performed both to ensure staff remain current with spill management procedures and to ensure the coordination of the various departments involved.